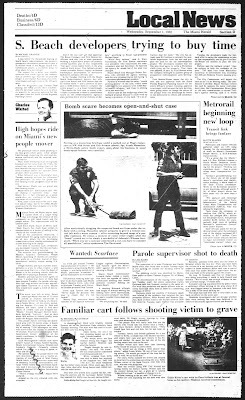 The end of this month marks seven years since Arthur E. Teele, Jr. took his life in the lobby of The Miami Herald minutes before the six o'clock evening news. Approaching July 27th, I've connected the old 1TB Buffalo TeraStation network drive and reopened the Miami Noir vault. Over the next two weeks, I'll post newspaper archives, photos, deleted scenes as we look back at the life, career and death of Art Teele. "Metrorail beginning new loop (The Miami Herald)" - September 1, 1982 was the ceremonial start of Miami's $116.9 million Downtown People Mover project. Teele attended the ceremony and announced that the Urban Mass Transportation Administration (UMTA) would provide an additional $3.96 million for the high cost of the metrorail's Government Center Station. Thirty years later the People Mover provides free transportation for those who work in the downtown/Brickell area. It brings us to Miami Heat games and is often used as an unofficial homeless shelter. 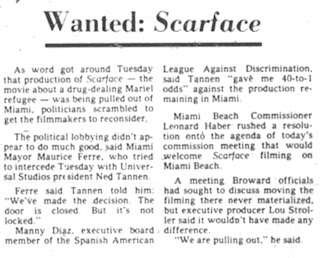 Also notice the article, "Wanted: Scarface." 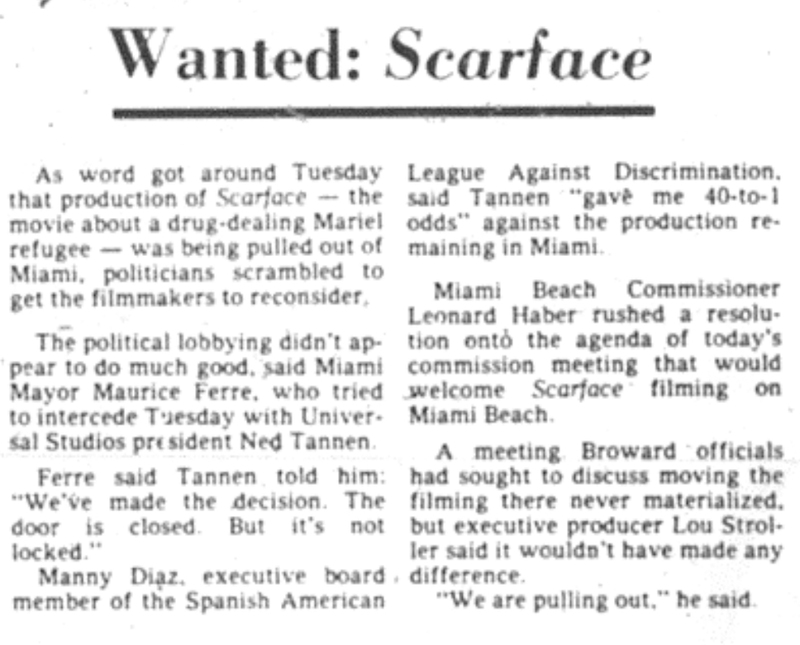 Politicians including Miami Mayor Maurice Ferrer scrambled to keep production of Scarface in Miami after it was reported that Universal Studios was pulling the film from South Florida. 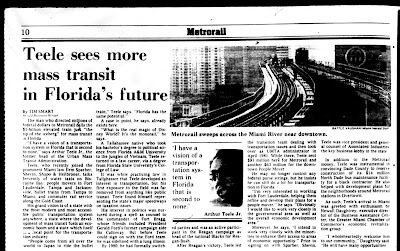 "Teele sees more mass transit in Florida's future (11/14/1983, The Miami Herald)" - After leaving Washington and his position as administrator for UMTA, Teele joined the Miami law firm Sparber, Shevin, Shapo & Heilbroner. He professed, "I have a vision of a transportation system in Florida that is second to none." He speaks of water taxis, people movers, bullet trains and commuter rail services throughout Florida. According to the article, "His grand vision is of a state with the most modern and most accessible public transportation system anywhere." Unfortunately, public transportation never lived up to Teele's dreams, however this past April, the City of Miami launched a trolley service. Smells better than the People Mover, which is nice.